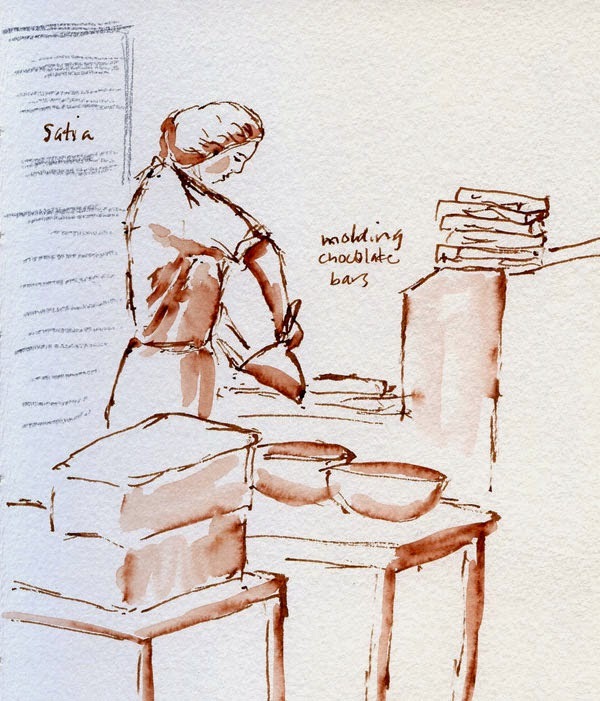 Urban Sketchers Seattle: Fran’s Chocolates! Under any circumstance, it doesn’t take much to get me to go to Fran’s Chocolates. And with my sketchbook? 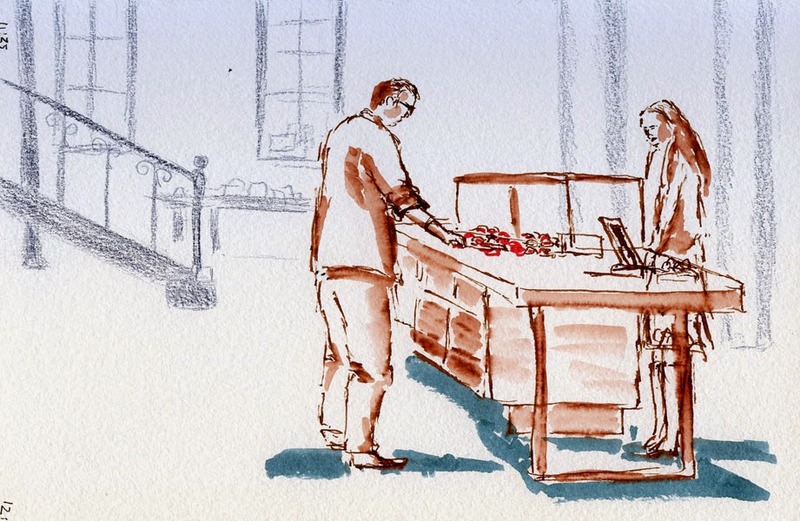 Meeting the Friday ad hoc sketchers at Fran’s new Georgetown location this morning was my idea of heaven: Sipping a mocha so rich I could have eaten it with a spoon, the scent of chocolate wafting gently from the kitchen, I sketched the workers handcrafting jewel-like creations through a huge window. As I sketched, Fran’s daughter Andrina came by to chat, and I told her that I have fond memories of shopping at Fran’s back in the ‘80s when she had a small storefront in Madison Valley. Fran’s newest location is in a building that started out as the Rainier Brewery’s ice house in 1902, Andrina said. It’s now a sparkling-white kitchen and spacious coffee and confection shop for the family-run business. 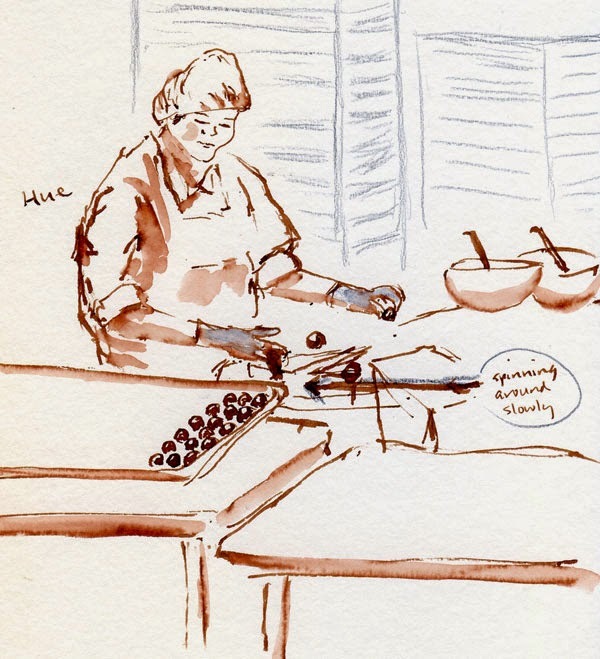 Although it was fun to tour Theo Chocolates a couple of years ago, it wasn’t conducive to sketching because we had to stay with the group and couldn’t linger where the action was. 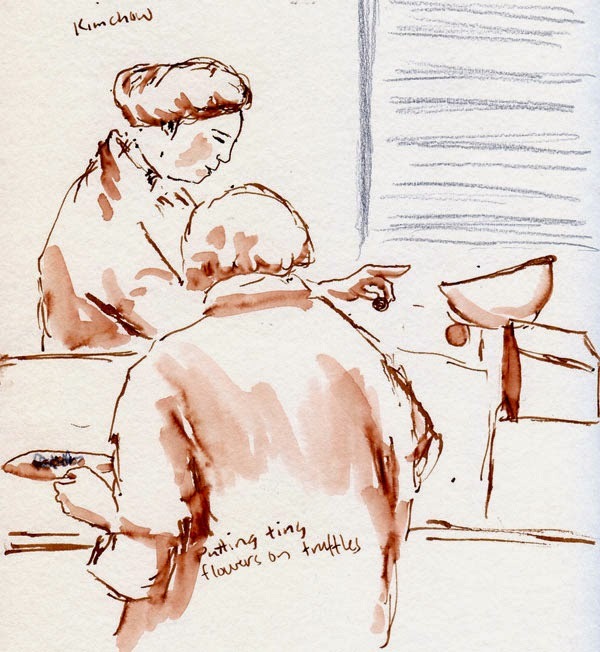 At Fran’s, I could sketch by the window at my leisure with a perfect view of all the activity. A heavenly sketch outing, indeed! 1/23/15 Putting tiny flowers onto individual chocolates.